How to Make a Crucial Decision for Your Business? In search of the optimal solution lots of app developers come up with a complicated choice: Is it better to build a native app (iOS, Android, Windows, Blackberry etc.) or to search for cross-platform opportunity? Being experienced developers of native iOS and Android application as well as competent professionals in cross-platform crafting, we want to explain all the strengths and threats, weaknesses, and opportunities that developers will face while choosing native or cross-platform solution. But at first, let’s puzzle out terminology, because it might be pretty confusing due to term mixing and its occasional substitution. Native apps are specifically developed for one exact platform (Android, iOS, etc.). Such ones can take full advantage of the chosen mobile operation systems like using the camera, the GPS, the list of contacts and other important native features. Native app development assumes the need to use specific platform SDKs and exact programming language. Typically, such apps provide the best user experience on AppStore and GooglePlay. By cross-compiled we mean mobile apps that utilize non-standard languages like C#, Ruby, PHP, Python etc. instead of using web canvas (Js, HTML, CSS). The code of such is written in non-native platform language. For example, Xamarin allows to craft iOS and Android apps in C# and RubyMotion lets you do the same with Ruby. Then, the original code is “translated” from C# (Ruby, Python, etc.) into native code that runs on each of the OSes natively. 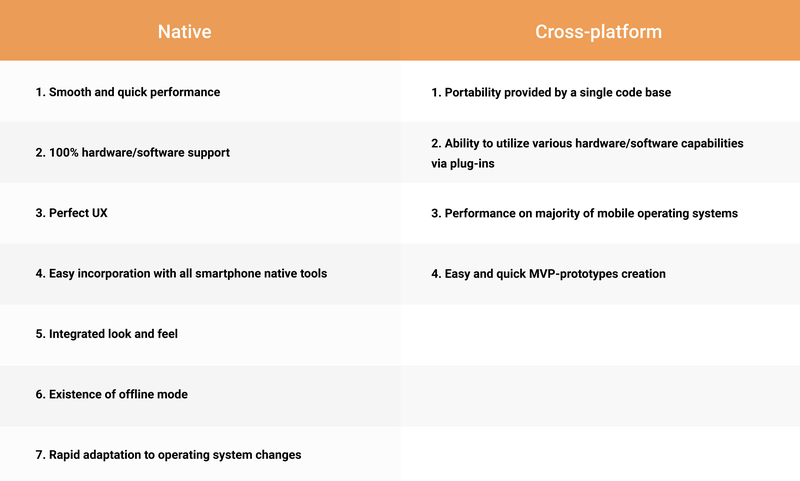 It’s important: Cross-compiled apps are much closer to native apps in their features, so while talking about pros and cons of native and cross-platform, we compare pure native and web-based apps, including hybrid. Hundreds of articles were written regarding the topic of Native vs. Cross-platform battle. Actually, each option could be perceived in both the positive or the negative way. We don’t want to pick either side, so our objective is to provide our readers the full description of each solution in order to make the choice easier to make. We don’t evangelize one solution over the other, though. Let’s analyze native and cross-platform apps based on their strengths and weaknesses, threats and opportunities. Talking about advantages of each opportunity, we can assume that native and cross-platform apps serve different purposes. Cross-platform is really good for MVP-prototypes, and native apps are the best option for a perfect user-experience. Comparing the types of apps in terms of weakness, it is clear that native apps are expensive, as they require more time (and money) during the Alpha version development. Nevertheless, cross-platform apps are cheaper only in case the app doesn’t provide some extra functionality and/or require smooth performance. In case it does, it will be more expensive to choose cross-platform than to develop two native apps. Talking about opportunities, each app developer concentrates on market benefits. 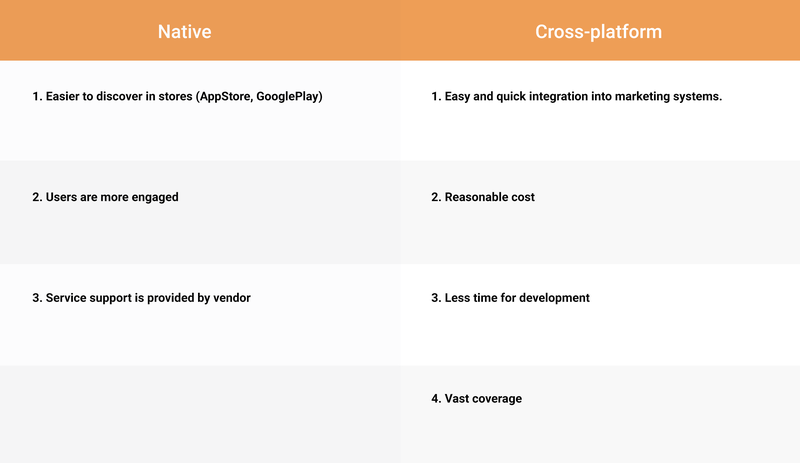 So, comparing native and cross-platform, the main choice will be between quick transfer to market vs. better engagement. Sometimes you need to catch the moment, so the cross-platform app with basic functionality is the better option because it requires less time and can be quickly transferred to the market. But in case your business strategy relies on great user experience and polished performance – native app is your choice. While comparing the threats, dilemma lies in terms of time. In case of choosing the native option, you will be messed up with additional features, it will be expensive and time-consuming. And if choosing the cross-platform opportunity you risk to disappoint your users with improper and untimely updates. “In case you need a proof-of-concept app without any amazing and complicated features, it’s easier, quicker and cheaper to go cross-platform. But let’s think about users’ preferences. The first thing that makes an app really valuable for customers is smooth and responsive UI. So users experience might be more important for your business than you ever thought”, says Oleksandr Korin, IDAP CTO. Native apps have the fastest experience ever for the end user. Cross-platform apps will never show such performance because the option doesn’t communicate directly to the operating system. And good performance is what really matters for your users, hence for the success of the app. In case of choosing native it’s impossible to be trapped into situation, when you need to write some additional lines of native code, because the platform (Cordova or Ionic) doesn’t support the features you need. This means you won’t have to involve additional resources. In case you need to integrate with the camera, the GPS, the contact list – native app is a better option, because it is easier to operate with native features using the native language. iOS and Android require different approaches both in terms of development and UI paradigm and make a lot of functions purely platform specific. So in order to gain a really smooth look, it is better to utilize native OS features. Cross-platform apps just can’t be that close. It provides security for users and makes apps really up-to-date. In terms of OS updates, which are regular and add additional features really fast, going native is the way to success. All these reasons are the parts of one big advantage: brilliant user experience, which is at the core of successful business strategy. Still aren’t convinced? So let’s recall the small history lesson from a social media giant, Facebook. After its attempt to build apps in HTML5 (mobile web apps), Mark Zuckerberg admitted it was one of the biggest mistakes ever, because that made a dramatically bad impact on performance and UI. We assume that there is a great variety of options in terms of marketing fluctuations, so always make a choice in accordance with your business strategy. We’ve given you our reasoning, tell us yours!